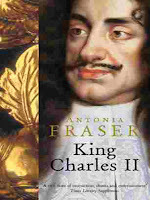 Antonia Frasers biography of King Charles the Second was first published in 1979 by Weidenfeld and Nicholson, and it has been sitting on my book shelf, unopened, for a long time. I finally got around to reading it last month and it was well worth the time. By ancestry, Charles Stuart was a quarter Scots, a quarter Danish, a quarter French and a quarter Italian, and yet from 1660 he was King of England, Ireland and Scotland. Both his mother, his paternal grandmother, his only brother James, and his wife were all Catholics but, until he became Catholic himself on his death bed, he was a member and head of the Church of England. He was married to Catherine of Braganza, but they had no children. He had numerous mistresses, and six of his illegitimate sons became Dukes. In fact his descendants make up a big portion of the English aristocracy. Apparently the late Princess Diana, as well as both the current Duchesses of Cornwall, Camilla, and also the Duchess of York, former wife of Prince Andrew, are, all three of them, directly descended from King Charles the Second in this way. When Princess Diana’s son, Prince William, becomes King, a direct descendant of Charles the Second will finally be on the throne , over three hundred years late! When his father, King Charles the First, lost the Civil War to Oliver Cromwell, and was subsequently executed, the younger Charles had to spend a great deal of time in exile in continental Europe, often leaving unpaid bills behind him, and living in the homes of supporters, like Thomas Preston, Viscount Tara, whose family still live in County Meath. Mainly, he was subsidized during his exile by King Louis the Fourteenth of France. He eventually was restored to the throne in 1660 because Richard Cromwell, successor to his father Oliver as Lord Protector, was unable to maintain order and security, and the head of the English Army, General Monck, felt that order could best be secured by the restoration of the monarchy. Even after his restoration to the throne, Charles had to rely on subsidies from King Louis the Fourteenth, because the English Parliament was inclined to impose unwelcome conditions on any money it might vote to cover the Kings military and other expenses. This, of course, constrained Charles’ foreign policy. It was during the reign of Charles the Second that Oliver Plunkett was condemned to death on trumped up charges. Charles did not do anything to stop this happening, despite his private Catholic sympathies. It was also during his reign that the Phoenix Park in Dublin was set aside as a public park. Apparently one of Charles former mistresses wanted it for herself, but she was blocked by the Earl of Essex, who was the Lord Lieutenant of the time. Antonia Fraser’s book is an entertaining account of Charles’ relationship with his wife, his mistresses and with his brother James. He managed to keep them all reasonably happy. It also brings out how central religious questions were in seventeenth century politics, notwithstanding the disorderly private lives of many of the leading protagonists. Charles was forced to accept a Test Act which excluded from public office all who did not attend Church of England services. The persistent attempts to exclude James from succession to the throne, simply because he was a Catholic, were a recurring theme in Charles’ reign. James did succeed when Charles died, but was overthrown by a military coup d’etat led by his son in law, William of Orange. As with Charles, Louis the Fourteenth came to James’ aid, sending an army to Ireland to fight in his behalf along with James’ Irish supporters. They were finally defeated at the Battle of Aughrim, in Co Galway, in 1691.